When it comes to garage door repair or installation in Chappaqua New York, you are in the right place! We offer same day garage door repair service in Chappaqua NY. Does the spring is broken? Do you need to install a new opener? Is one of the sensors is not balanced? Is your garage door out of track? We can help! 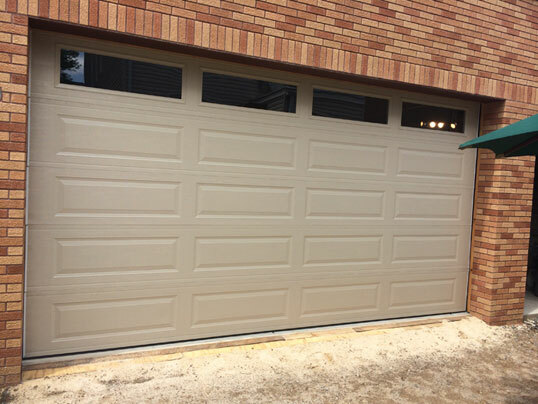 J&C Garage Doors offer same day garage door repair service in Chappaqua NY. Many times our customers contact us, and saying that their garage door opener is not working. When we get to the customer - whether they live in Chappaqua or somewhere else in New York - and we inspect the garage door, we find that the opener is working fine, and the problem is actually the garage door spring which is broken or damaged. The reason for that mistake, is that most people think that the force which lift the garage door is the opener, when actually the garage door is being lifted by the springs, and the opener is only doing a small part in lifting the garage door. Every garage door opener manufacture will tell you that they create the best garage door openers. The truth is that there are many openers makers in the market, but only few of them really manufacture a high quality opener that can last between 5-15 years. We believe that investing money in a high quality garage door opener, is an investment that will save you money in the long run. Since a good garage door opener that was installed by a professional garage door tech can last for many years, and you do not want to save few dollars, just to find that after 2-3 years you need to repair or replace the cheap opener you purchased. If you live in Chappaqua, and you are looking for a garage door company that offer high quality garage door openers, know that you just found them. From torsion spring system repair, to extension spring system, when it comes to garage door spring repair in Chappaqua, J&C Garage Doors are here for you. We have the experience to match the right spring for the right garage door, and we carry in our service tracks all the equipment that a garage door technician need, in order to compete the project at the first visit. Since a garage door with a broken spring should not be used, and since we know how important it is for you to get your garage door repaired ASAP, we offer a same day garage door repair in Chappaqua NY, so you know that someone will fix your garage door today. Please note, that for safety reasons, every garage door that work with extension springs, should be equipped with safety cables, which should restrain the breaking spring, and protect people or objects which located near the door. No matter if it is a garage door installing in Chappaqua, or a garage door replacement in Brooklyn, every garage door installation should be done by a professional garage door technician. There are many reasons that can lead you to decide to purchase a new garage door: from a garage door which is too old to be used, to a garage door that was hit by a car, to some people who from cosmetic reasons, are interested in installing a new garage door. Now, since a new garage door is something that you do not want to do every 2-3 tears, and you probably don’t want to repair it every other year, we recommend all our customers to invest their money in a top quality garage door from the leading garage doors manufactures, and which designed to fit the American standard. From custom wooden garage doors, to aluminum and insulated garage doors, we got it, all you need to do is to contact us, and let us help you find the next garage door for you. If you need a garage door repair in Chappaqua, or if you need a new garage door installation, or if you have any questions regarding your garage door or gate in Chappaqua, do not hesitate, and call us, and we will do our best to provide you with the best service and knowledge that we collected during years of service in the garage doors and gates field. So if you are located in Chappaqua New York, contact us, and we will be happy to assist you with all your garage doors or gates needs. Whether it is a commercial garage door, or a residential garage door, we can help. 24/7 same day service for all garage doors at Chappaqua. A real person customer service. Repair of all garage doors models. Using the best garage doors parts in the market. Fair prices for every job. Out of track garage door repair.